Women's Long Sleeve Jersey T-Shirt is in stock. We will print it as soon as you order it. 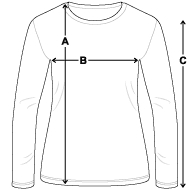 This long sleeve jersey t-shirt has a custom contoured fit and is super comfortable. It’s perfect for layering in the cold months and great for a lighter outer layer in the warm ones. This item runs small. Fit just a tish larger than past purchases. But it still looks great and I live it. I love it, very comfortable. The material is a bit rough, also would like help with re-ordering and making the letters stand out more.